Singer/songwriter/ guitarist Steve Palmer worked for his Blackbird session with Bryan Ewald on lead guitar, Anthony Setola with bass(who is now replaced by Mario Sangermano), Tony Morra provides drums, Larry Hall offers up keyboards and Hammond B3 organ, and Vicki Hampton can be heard on background vocals. The band can be found touring with Blues Traveler and has opened for Sister Hazel and Bob Schneider. With Palmer also playing solo shows. 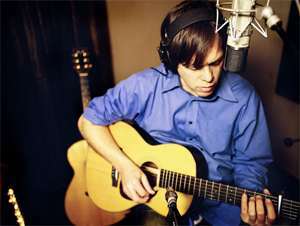 He can be found where he now resides in Nashville, TN where his latest album Apparition was recorded. Maximum Ink: Since there isn’t much out there on you yet, can you tell our readers a little about where you are from? How has your background influenced your musical stylings? How have you changed most since your early days? Steve Palmer: The early days are real easy for me to describe. I started playing in Connecticut – I’d pick up a guitar and a pick, open my song book of the sixties and seventies (compiled by the New York Times) – and I played and sang. I sang a lot of different stuff from John Denver, Peter Frampton, Harry Chapin, Rolling Stones to James Taylor. And I listened to Jazz, Oscar Peterson, Joe Sample, Weather Report and John Coltrane. I think that’s where everything starts-the theory and feel of music and minor and major keys. Jazz is a huge influence for me but so are the greats including Bruce Springsteen, Doobie Brothers, Bob Dylan, Cat Stevens who I played till the book wore out. Classical also opened up my musical mind. Then after a year of that, I started performing in sixth grade and whenever anyone wanted to hear a tune. I played at talent shows, did some musicals, played at a few bars and restaurants but nothing with a band. My first song went something like, “Five Foot Two, Eyes of Blue and . . .” Now you know that’s probably a fifties jazz number. Later, I spent a year in England my senior year in High School and started recording. First, it was with a good friend, Paul Hussell, on piano, guitar or even cello and then I came back and went into full-fledged recording sessions with first call New York City musicians at age eighteen. I played with some awesome guys but I never could find anyone who wanted to help me make a contact or sign me. So I just kept writing and writing even in college where I did two more recording projects. In 2004-2005, I recorded four records with a producer in Virginia but things got finally rolling with my current group when I went down to Nashville and I went on the road. I had a lot of problems with studios and engineers and quality but I am happy with “Apparition” now. It just was very difficult to get to this point. I had to take “do it yourself” to the extreme. So that is how “Apparition” came into being. Out of Virginia and Nashville with some great studio musicians. MI: Who were some of your earliest influences? Why? SP: My one single greatest influence was Cat Stevens or Usaf Islam as he is called now. He was a very warm hearted poetic balladeer who believed in peace and love. Also Dan Fogleberg, Yes, Kansas, Led Zeppelin and, of course, the Beatles because of their song writing and bands. Now I listen to Magnetic Zeros, Tegan and Sarah, The Veronicas, Dawes, Jenny Lewis, Death Cab For Cutie, Dave Mathews, Coldplay and Nicole Atkins. There are great groups out there – you just have to go find them. I am not impressed with everything the industry and radio does. Art should be an open forum. But I go back to Cat Stevens because he was a singer/songwriter who went his own way and I found that compelling. I also think he was visionary that the industry hasn’t given much attention to. Joni Mitchell and Joan Armatrading were also huge on my list because of the acoustic rhythms and Chuck Mangione and even Stanley Turentine because I loved instrumental work whether you call it Jazz or Fusion or Smooth Jazz. It was all music to me. MI: What was it like to open for Blues Traveler? Did you ever imagine you’d be doing that? SP: Well, I did imagine it and I felt I had to do it. We quickly built up to Blues going from Marcy Playground, to Bob Schneider to Sister Hazel. Blues Traveler was a good break for us. I just wish we could have delivered on media, radio and video promotions at the same time like I planned but we did not have the right team or mix at that time. And I think we might now. But that’s what I wanted to do to catapult on a big stage in front of a well know respected national act. And that is what Johnnie Popper is. He is the quintessential musician and writer and all around good heartened spirit. He was just a very nice guy to us. But we did have some major logistical and sound problems on the road. It wasn’t Johnnie’s fault but it was a mess for the first four gigs. Things were canceled, I could never hear the band and on and on but we ended up on a high note in Windsor Connecticut, Kenne New Hampshire and Epicentre in Charlotte. So that is the important thing. Things got better for us. And I spent some time with Johnnie and hope to play with him again sometime. MI: How would you yourself describe the sound of Steve Palmer Band. SP: One word: intense. It comes mostly from the drums and the B-3 and maybe my voice a bit. On the writing side I think it is lyrical and melodic but on the production side we are rhythmic based even though we don’t use machines and loops very often.Maybe in the future but right now we are live, very together and jam based because I don’t have the players memorize parts. We spent a lot of time on rhythms in rehearsals, getting strong bass undertones, working on the guitar selection and how the two guitar parts mesh together or alternate. And when you fuse that with a B-3 and my vocal we end up with a rhythmic vibe that you can dance to or just enjoy in the car or at home. MI: What was your first day in Nashville like? How do you like living in TN? SP:Well I have to tell you. I was there a lot for six months – almost continuously – recording, singing, knocking on doors of agents and record companies trying to meet people, and then back to recording and filming videos. I started in May of ’09 through the end of that year. I like Nashville and wanted to live there but just couldn’t at the time. And I know quite a bit about the people, the community and the businesses.I saw performances in classical halls and at the Ryman and walked up and down Broadway almost daily. The first day, was just me checking out two different studios right off a plane with my drive in my hand. I met Vance at Blackbird who seemed like a down to earth guy and some producer who later evaporated. MI:Did you enjoy recording Apparition at Blackbird and Sound Shop Studios? SP: I actually, took Sound Shop off the credits on the CD because we did not use what we did there. But I will say it was a busy and challenging time. We recorded Apparition and another CD twice complete with mixing and mastering so it was a lot of work on that 96 channel SSL. They have some amazing equipment over there at Blackbird. MI: What did it feel like to be called a modern day Roy Orbinson by The Muse’s Muse? Are you a fan of work? SP: Well, I really can’t comment on that because he is a legend and had a beautiful voice. Everyone you could ever mention would tout him as one of their great influences – including me - but I just can’t compare myself to him. He was truly an original and a terrific artist. And, yes, I have a lot of music in my catalogue but what I really want is to get “Apparition” to the public and develop a fan base. Until that happens, you won’t see me pat myself on the back or comparing myself to someone like Roy Orbison. I am definitely a fan. He was a real deal and great writer. But I can’t say I went out and bought his records or saw him in concert. I just listened and watched him perform. MI: What can your fans expect from the live show? SP: I would like nothing better than to put together a huge show where we could play for two hours. I would bring in two back ground vocalists with a percussionist, a B-3 obviously, and maybe some synth patches. That’s what I would love to do – put a big show together with a big band sound but we just aren’t there yet. When we get a big fan base and sell a bunch of records, I’ll do it. Or, hopefully, while we are starting to sell some records. When I have a verifiable hit or some support or a deal, I will get excited and get the show on the road. MI: You also do solo shows, how do those differ from the shows with the band? SP: Well, I get to perform the way I write and do percussion on the guitar along with augmented vocal riffs. In other words, I get to improvise and be the band which I love to do. There is a new live solo performance of Apparition up on my website recorded at Interlochen Public Radio Station. I will say I would rather be in front of Tony Morra on drums and Bryan, my musical director on lead guitar but right now I’ll play Birchmere or Ryman solo, stripped down acoustic or five piece rock and roll. But where I want to be is Madison Square Garden with seven or eight players with me. That’s what I have always wanted. SP: Exercise, play or watch sports, read and write and go out with my two little girls. Kayleigh and Natalie are the most important things in my life and I love them and try to help any way I can. One is a really good songwriter and singer and one is studying literature, but they are young and we’ll see what they end up doing. MI: How do you think your career has changed most since you started in the business? SP: Right now I feel like a business manager who is trying to claw his way to the top of the pile or through the wall so he can pick up his guitar and sing for some people. I wish I could play more. I am doing the work of three people in the office and rehearsing and gigging in my spare time. And when I feel inspired, I still write. For example, we are promoting “In Love” which was a last minute add-on track on the “Apparition” album. I wrote it the week or two before we recorded it because my radio promoter thought it would be a good idea. And I’ll add, anyone can download it free on the website to help us raise and donate money to Save The Children and Saint Jude’s Children’s Hospital. SP: Well, I would like to have a project to work on. Do you have any ideas or offers? I am always writing and experimenting but really I want to get some film and TV music placed. And that hasn’t happened yet. My biggest project is trying to bring Steve Palmer Band public and run the label – Arythmia Records that is. MI: What would you most like to say to your fans out there? SP: I don’t know how many fans I have but the ones that have visited the site and heard the show or share “In Love,” I would say that I care very much about you all. And I hope they will hang in there until we get a hit, sell some records and can get the backing it takes to bring my music directly to their home town. Right now I’m living off the goodness of my parents and there is only so much I can ask of them.I need the industry to start helping. And, of course, I hope my fans share our music with their friends. I love to play for people that love music and all the good will and good feelings it brings. And I’ll say to your readers, check us out and hopefully you will become fans.